A few weeks ago the kind people at Vanguard sent me a new product for me to trial in the field and report my findings. The item in particular was the Vanguard Alta pro 2 + 263AP tripod. This is no ordinary tripod. As you will discover it has a few unique talents that makes this a very capable piece of kit. This is by no means a technical review but a user report. I intend to show my findings having used it in the field. Below, however, I’ve listed a few technical details to set the scene. To put Alta Pro 2 + 263AP tripod through its paces I teamed up with friend and fellow photographer Chris Nowell for a day of photography on the east coast. For the purposes of this report I shall refer to the Alta Pro 2 + 263AP simply as Alta Pro 2. My first impression was how sturdy it felt. Just by standing it up you got an overall feeling of stability which is a very good thing as this is ultimately what I look for in a tripod. This version of the Alta pro2 came with the 3 way pan head but I know it’s also available with a ball head, grip head or no head. This version is made from magnesium aircraft aluminium for rigidity and lightness. Together with the pan head it weighs a modest 2.5kg. Included with the tripod is a carry case, instructions and an allen key to presumably use to tighten or remove the head. So what are my needs of a tripod? This depends on what I will be using it for and where I will be taking it. If I am on a photography shoot and camera gear is all I am carrying the ultimate requirements are stability, ease of use, versatility and trust. I say trust as I want to have complete confidence in its ability to hold my expensive camera and filters without the worry of it failing in some way bringing it crashing to the ground. If, however, I’m going hiking in the mountains then weight becomes an issue as I usually carry camping gear, sleeping gear, food, water etc therefore if I can cut weight anywhere then I will. So, straight away I can say that if I was on a day’s shoot with only camera gear to carry then the Alta Pro 2+ weight at 2.5kg is fine as I would trade the weight for extra stability. If, however, I’m hiking in the mountains for a weekend I’d compromise and take a lightweight tripod. As I’ve already mentioned we had a trip out to the East Coast for a full day’s shoot and took the opportunity to use the Alta Pro 2 +. We planned to photograph Flamborough Head at sunrise, wildlife at Bempton Cliffs, Whitby Abbey mid day and finish for a sunset at Saltwick Bay. This tripod was on loan by Vanguard so I didn’t want to damage it or get sand in any joints on the legs so I saved my trial until we got to Whitby Abbey where at least I knew it’d be safe environment. We arrived at Whitby Abbey car park unloaded our kit and walked over to the Abbey. We didn’t realise the conditions were going to be especially challenging. I had a picture in mind before even getting there; I wanted bright sunshine, white fluffy clouds moving across the sky to make a picture showing the movement contrasting with the stone and it’s centuries of defiance against weather and war. To achieve this shot I’d be using a very dark neutral density filter to lengthen the exposure sixteen times longer than a normal metered exposure. This would record the clouds blending as they moved across the sky and create a streaky ethereal type effect. The conditions were perfect for this; the sun was bright, the clouds were shooting across the sky and the long grass being buffeted by the wind. The biggest challenge I had was keeping the camera absolutely still; this is where the Alta pro 2 + came in. I had worked out that with the 16 stop ND filter attached I’d have to keep the shutter open for 5 minutes and 22seconds to achieve a good exposure. That is a very long time keeping the camera still in 40mph winds and even stronger gusts. As you can see from the picture, (curtesy of Chris Nowel, thanks! ), I also got a brolley in on the action to try and protect the camera from the sudden gusts. I found my composition with the pond in the foreground and the long grasses blowing around it; the Abbey standing slightly to the left of the scene creating some balance and negative space to the right; by positioning the Abbey here I could also eliminate Whitby town itself from the scene as it was a little distracting; there were lots of people around but by lengthening the exposure with the 16 stop filter all the people would magically disappear as they are not in the scene long enough for them to register on the picture. Setting up the tripod was made simple by a few nice well thought out functions. The legs are in three sections achieving a maximum height of nearly 69 inches which is nearly 6 foot. They are extended by the very clever twist lock mechanisms which you can operate single handed. The default angle of each leg is 20 degrees when open and can be accurately widened by four preset angles increasing by 20 degrees at at time 20/40/60/80; each angle achieved by a very reassuring click as it engages. The one handed twist lock system and the multi angled legs make for a very easy and quick set up. Taking into consideration the 40mph wind, I set the Alta Pro 2+ legs at 40 degrees on each leg for increased stability. One thing I noticed, at this point, was the clever way the feet that are shaped; they roll with the increased angle giving maximum contact with the ground at any angle. I mounted my camera on the Arca type head; extended the telescopic handles by simply clicking the buttons on the handles and used both together to compose and level my shot; very quickly and accurately indeed! So, all that was left to do was set my focus, mount my filter, check my exposure and hit the shutter button and timer at the same time and off it went! Whitby Abbey.... achieved with Olympus OMD em5 mk2 9-18mm lens, Kase 10 stop filter, 5 min 22 second exposure at f11 with The Alta pro 2 + 263Ap tripod and an umbrella! For the second shot of the Abbey I still wanted more of an abstract picture of the arched windows and the clouds. I didn’t want to completely lose all form of the clouds as with my first picture but just to blur them slightly to show soft movement in contrast with the hard stone. For this I used a similar set up but with a very low position looking up through the windows and a slightly lighter Neutral Density filter of 10 stops making my exposure seconds rather than minutes keeping some form in the clouds. The set up of the tripod was to be a little more challenging as I wanted a very low perspective looking up. This can be impossible for some tripods because the centre column only allows the tripod to go so low before getting in the way. The Alta Pro2 +, however, has a trick up its sleeve not apparent straight away. Ingeniously, the centre column can be raised to its maximum height and because of a special hinge system can angled horizontally enabling the legs to fully open to 80 degrees on each. The now horizontal centre column can now be hinged negative to horizontal meaning the camera can be very close to the ground. With such versatility, the camera can be manoeuvred to almost any angle at any height up to its maximum reach height of nearly six feet. So, getting back to my picture; now I have my composition with a very low camera angle achieved by very wide tripod legs and the hinged centre column set horizontally with my camera in portrait position. The next question was can this position be stable enough in high winds to achieve a sharp picture? Yes!! My final test of the Alta Pro 2 and the pan head was not to happen for a few weeks; this time whilst out in the peak district. We had weeks of fabulous sunny weather; unfortunately this led to quite a few frustrating mornings of either clear blue skies or flat grey clouds, which are equally tedious when trying to make a striking landscape picture. Finally, however, persistence paid off and I made a few panoramas with the alta pro 2 + making use of the pan head. At first glance you may think there is nothing special about this tripod head, however, it does have a couple of tricks up it's sleeve that I shall discuss later. Set up the tripod to the desired height using the quick release twist lock legs and spreading them to 40 degrees using one hand! 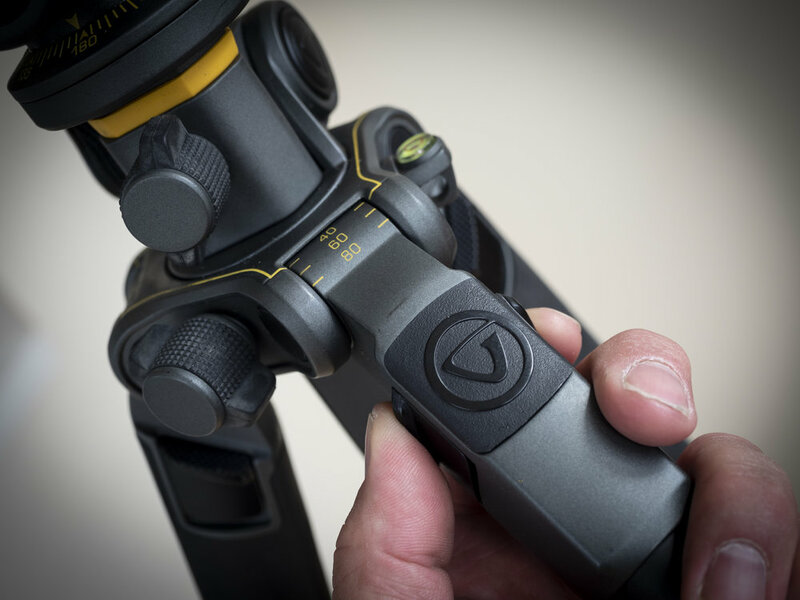 This is a very capable tripod with design features that you don't find on any other tripod. The single most important role of a tripod is to hold the camera steady and this certainly does that, it holds it rock solid! In my opinion, if a tripod can achieve that then everything else is secondary and a bonus. However, the "secondary" features of this tripod have been well thought out, make photographing easy and work brilliantly. The way the centre column articulates is very useful in many ways. The twist lock legs and multi angle legs work simply and quickly. The pan head is easy to work with its smooth and accurate movements. All these features combined mean Vanguard have designed and produced a tripod that is not just a stand with three legs to stand your camera on, they've produced a rock solid platform capable of holding your camera steadfast in challenging conditions with no vibrations or shake enabling pin sharp pictures to be taken, at the same time as being easy and quick to set up.